"That's why he always grew it so long, so he could try to mesh it together on the chin," she told Andy Sandness, as he shut his eyes and braced for the tickle of her touch on new nerve endings in the face that had been her husband's. 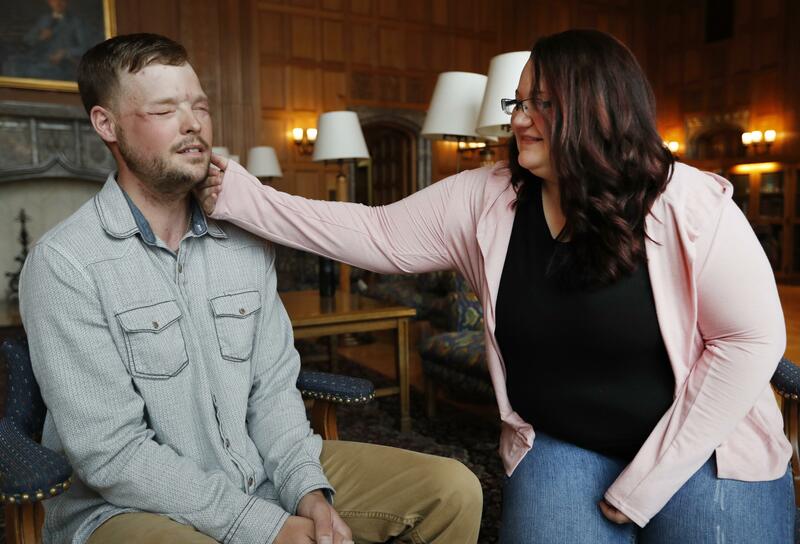 Sixteen months after transplant surgery gave Sandness the face that had belonged to Calen "Rudy" Ross, he met the woman who had agreed to donate her high school sweetheart's visage to a man who lived nearly a decade without one. The two came together last month in a meeting arranged by the Mayo Clinic, the same place where Sandness underwent a 56-hour surgery that was the clinic's first such transplant. With her toddler Leonard in tow, Ross strode toward Sandness, tears welling in her eyes as they tightly embraced. Ross had fretted before the meeting, fearful of the certain reminders of her husband, who took his own life. But her stress quickly melted away — without Calen's eyes, forehead or strong cheeks, Sandness didn't look like him, she told herself. Instead, she saw a man whose life had changed through her husband's gift, newly confident after 10 years of hiding from mirrors and staring eyes. "It made me proud," Ross said of the 32-year-old Sandness. "The way Rudy saw himself ... he didn't see himself like that." Ross already had agreed to donate her husband's lungs, kidneys and other organs to patients. Then LifeSource, a Midwestern nonprofit organization that facilitates organ and tissue donations, broached the idea of a donation for a man awaiting a face transplant at the clinic. Ross and Sandness' ages, blood type, skin color and facial structure were such a near-perfect match that Sandness' surgeon, Dr. Samir Mardini, said the two men could have been cousins. Ross consented, despite her hesitation about someday seeing her husband's face on a stranger. Eight months pregnant at the time, she said one reason to go forward was that she wanted the couple's child to one day understand what his father did to help others. He's been promoted in his work as an oilfield electrician and is expanding his world while still prizing the anonymity that comes with a normal face. "I wouldn't go out in public. I hated going into bigger cities," he said. "And now I'm just really spreading my wings and doing the things I missed out on — going out to restaurants and eating, going dancing." Life with a transplanted face takes work, every day. Sandness is on a daily regimen of anti-rejection medication. He's constantly working to retrain his nerves to operate in sync with his new face, giving himself facial massages and striving to improve his speech by running through the alphabet while driving or showering. "I wanted to show you that your gift will not be wasted," Sandness told Ross. Mardini and the rest of Sandness' medical team have delighted in seeing their patient and friend open up since the procedure, going out of his way to talk with strangers whose gaze he once hid from. "It turns out Andy is not as much of an introvert as we thought," Mardini said. "He's enjoying these times, where he's missed out on 10 years of his life." Ross and Sandness say they feel like family now. They plan to forge a stronger connection, and Sandness said he'll contribute to a trust fund for Leonard's education. "Meeting Andy, it has finally given me closure," she said, her voice choking as it trailed off. "Everything happened so fast."